L-R: Borys Wrzesnewskyj, Ostap Skrypnyk (UCC Executive Director), Paul Grod (UCC 1st VP), Irene Mycak (Chair, UCC Canada-Ukraine Committee), Rt. Hon. Paul Martin, UCC President Irene (Orysia) Sushko, Andrew Hladyshevsky (UCC 2nd VP), Hon. Aileen Carroll, Hon. Walt Lastewka. 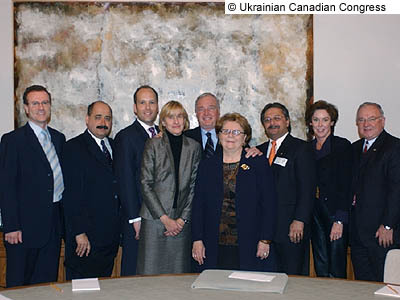 On December 9, 2004 the Ukrainian Canadian Congress met with the Rt. Hon. Paul Martin and the Minister of International Cooperation, Hon. Aileen Carroll to discuss the current situation in Ukraine and the Government's plans for future Canada-Ukraine relations. UCC took the opportunity to thank the Government of Canada for its commitment to assisting the democratic process in Ukraine by funding up to 500 election observers. Other current issues vital to the Ukrainian Canadian community were touched upon and will be discussed in greater detail at a later date. Also attending the meeting were MPs the Hon. Walt Lastewka and Borys Wrzesnewskyj.